Hello Wednesday! Spring is finally here and you know what that means? Hot housing market and open houses at every corner! Are you shopping for a new home or about to put your home on the market this spring? 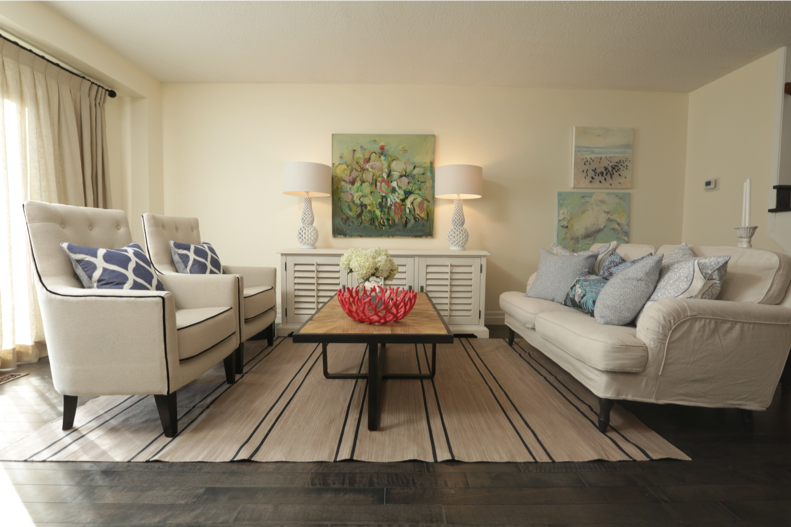 I'd gone through my fair share of open houses (around 80) when shopping for my condo and Chris' condo last year, and I have to say most of them had very little staging. For the ones there were staged, they didn't leave me with a strong impression. To be fair, I generally prefer a well-maintained but dated home so I could put my own design stamp on it without worrying the expensive re-construction bill (and hopefully to get it for less since most other people would like a turn-key home). 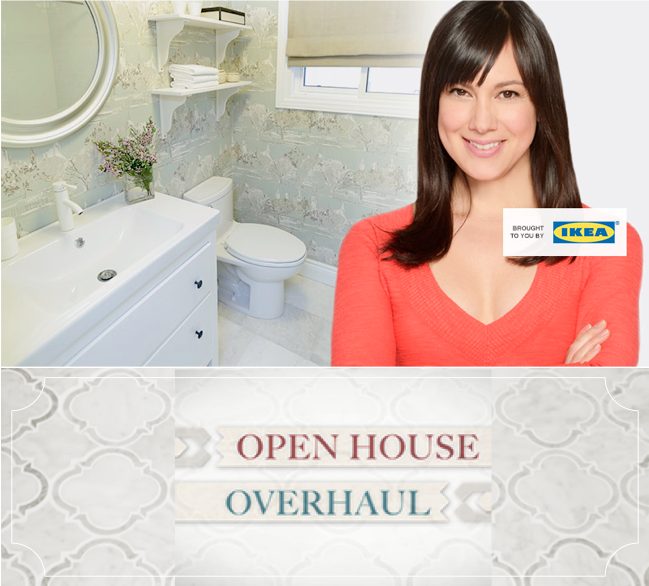 Now if your home is about to be on the market and you want a quick sale at top dollar, you have got to watch Sam's brand new show at HGTV Canada, Open House Overhaul. Week after week, Sam helps ill-presented homes to reach their full potentials, just in time for the next open house. 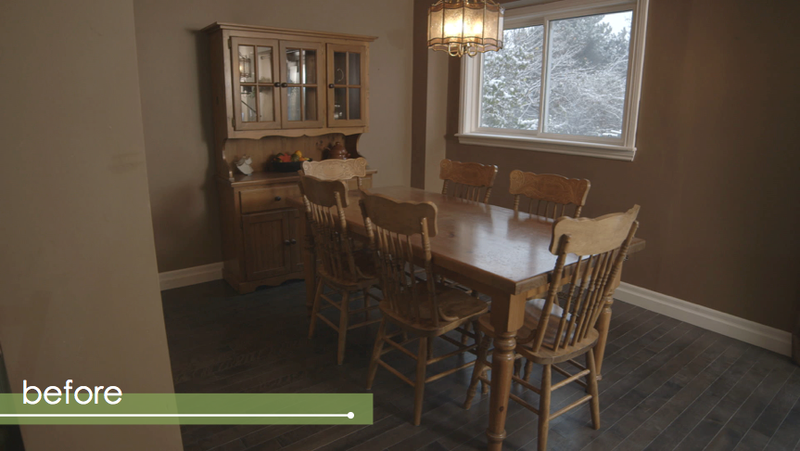 The timeline is tight, the transformation is dramatic, and the reward ... let just say the home owners were more than please with Sam's designer magic! Here is a family home with mismatched furnishings from the past couple of decades. Can you see pass the taupe walls, the grandma style sofas, and the brown leather ottoman and think this could be a bright and stylish room? Not all buyers are imaginative and making your home appealing to most buyers (without exercising their imagination) is key to selling your home fast and at top dollar. So here is what Sam's done: a fresh coat of paint, re-position of furniture layout, and of course far more stylish and classic furnitures, this living room is now elegant yet inviting. Who wouldn't want to lounge in this room? The freshly painted white walls and light colored furnishings make the room feels so much larger and brighter. The pair of statement lamps and a grouping of artwork set this house apart from other builder basic cookie cutter competitions. If there is nothing wrong with your furniture, invest in a new removable slipcover or freshen up the piece with a coat of paint. You will be amazing by how the little details impress the prospective buyers. 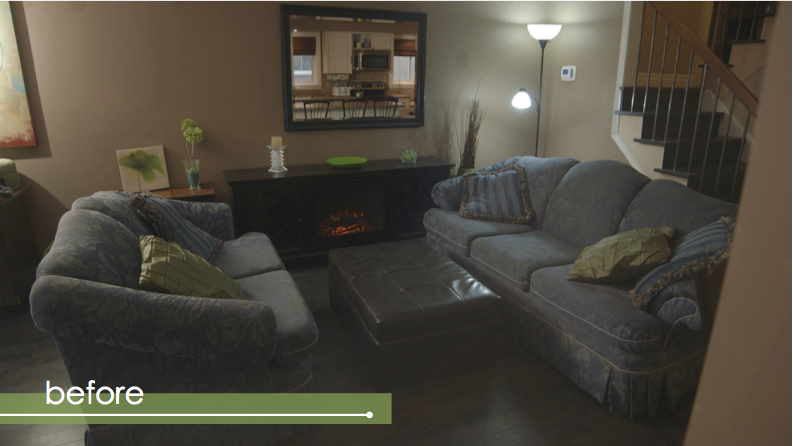 Another tip from Sam is that when staging your home for sale, you want to present a life style. You don't want it too personal because that may make it difficult for the buyers to connect themselves to your home. 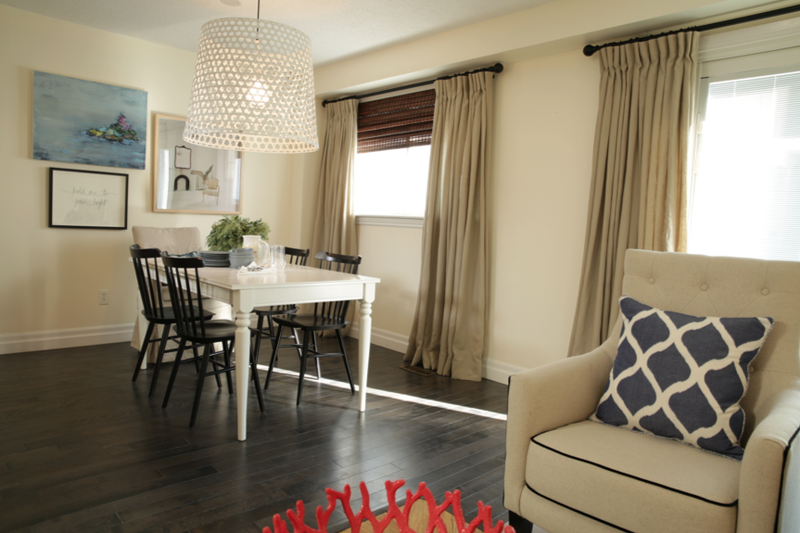 Take this open concept dining / living + kitchen main floor as an example. Once a taupe space with pine furniture, now it screams cozy and chic thanks to the oversized but airy lighting fixture, sophisticated black and white palette for the dining set, elegant full height drapery panels (the room feels so much taller), and the kitchen looks brand new now that it blends in seamlessly to the adjacent spaces. 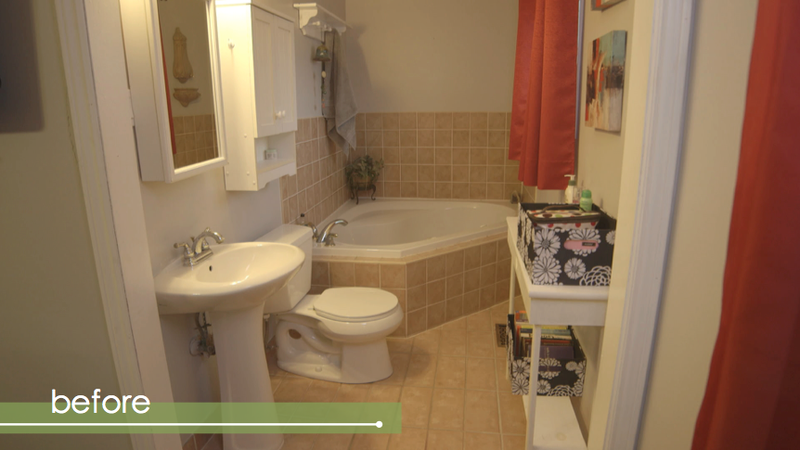 Our last stop at this open house is the ensuite bathroom. 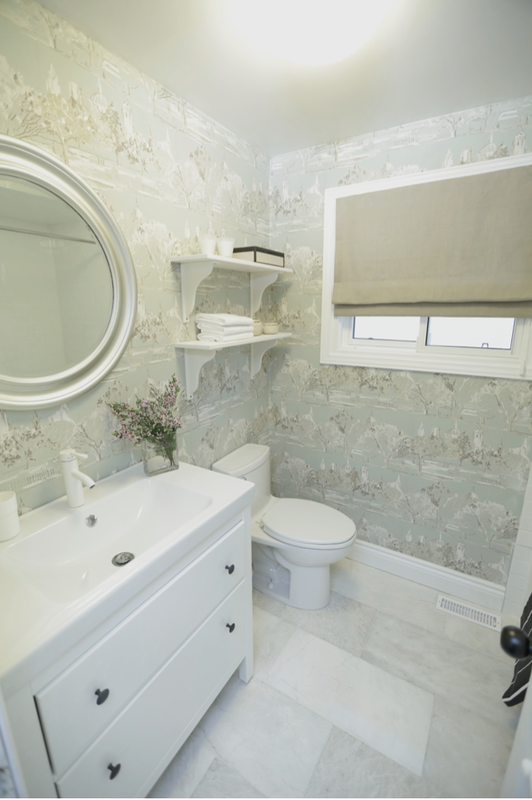 First thing first, Sam gives this ensuite the privacy it deserves by adding sliding barn door. 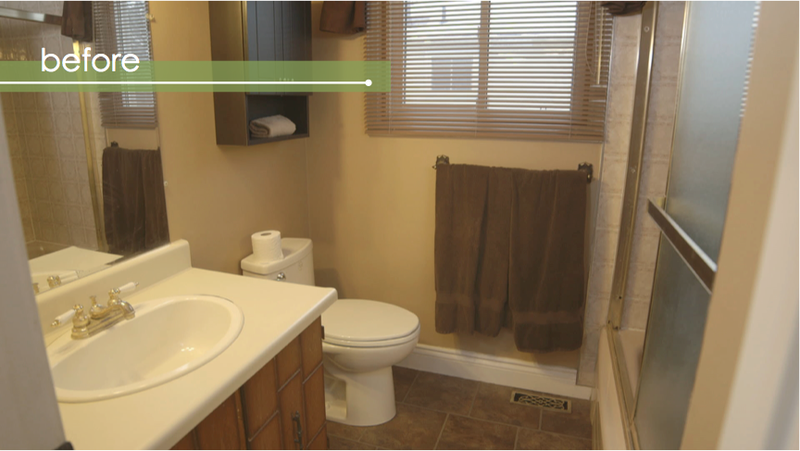 To max out on storage without sacrificing style, Sam installed a 30" floating vanity and medicine cabinets. The track system on the glass shower echoes the contemporary sliding door. 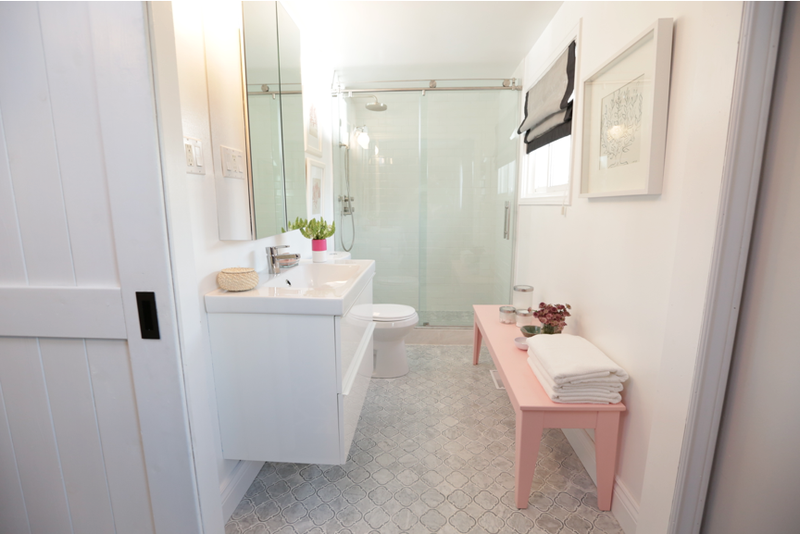 As for my favorite elements in this ensuite, I am crazy about the rain shower head + handheld shower system, the dynamite patterned stone floor, and a shot of delicate blush on the bench. This bathroom now feels like a spa! Want to learn some more bathroom tips? Here is Sam's top advice on Bathrooms. Sam Pynn is so cute, and she & her crew do fantastic jobs. I assume all the furniture is on loan from IKEA to whom it is returned for use on a future show. Either the homeowners have probably sold their homes already and it's all just a setup for the new show or do they get to use the IKEA stuff until their houses get sold, I wonder how that works. Either way, we get to see some wonderful transformations.